For instant impact with the minimum fuss, our most popular Roll-Up Banners are your only choice. They are amazing value for money and, by including a full colour digital print, they are one of the best buys on the market. Our fast and professional service also makes ordering your Roll-Up Banners a hassle-free experience. Of all the indoor display units we offer, the roll-up banner is by far the most popular choice among clients, especially the 2m x 850mm one. 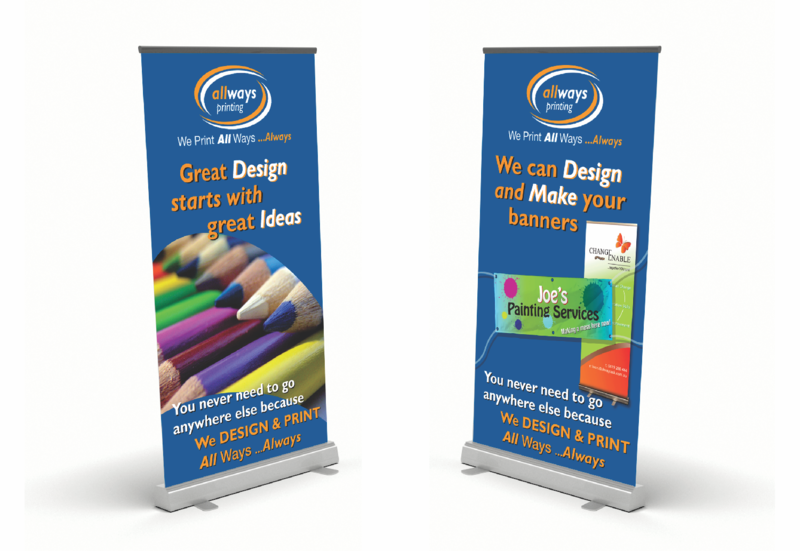 Roll-up banners can also be used next to one another to create a “wall of banners”. If used in this method please note that there will be a gap of about 30mm between each banner. This option can be used as an alternative to Banner Walls. We use a material named non curl PVC for our pull up banners to prevent the ends from curling over and to keep it from looking sloppy. Roll-up banners are also known as roller banners, retract-a-screen, retract-a-banner or pull out banners. Roll-up banners are mostly for indoor use, but in certain circumstances it can be used outdoors. When used outdoors you will have to stabilize the banner with sandbags or something similar at the base, although we don’t recommend it because it will look untidy. The Roll-Up Banners are supplied with a neat carry bag for easy handling and safe storage and weighs only about 4kg depending on the base unit you choose. We offer a Graphic Design Service to work from your sketches or ideas on the Roll-Up Banners. Roll-Up or Pull-Up banners can also be printed double sided. When it is printed double sided, 2 banners roll into the base. The banner is 2m in height from base to top but can be shortened by just cutting the support pole at the back with a few mm.